Ahoy Jim Lad! What on earth could ye do on 'Talk Like a Pirate' Day if ye be a keen book swabbing blogger who sails the seven seas of children's books in search of booty? Well you could stop talking silly and publish a lovely list of essential piratical books to tickle the fancies of any scurvy coves who pass by your blog. So that's exactly what we're going to do! A young girl sets sail to visit her grandmother, and falls foul of the stinkiest, nastiest pirates ever seen. They soon put her to work swabbing the decks, darning their stinky socks and cooking for them in the galley. But the girl is smart, and has a secret plan to escape. 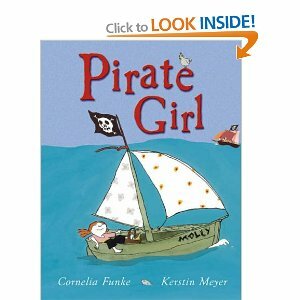 For she is no ordinary girl, she is Pirate Girl. An absolutely lovely little tale showing pirates as the rather daft, rather stinky and rather inept coves they really are. Jonny Duddle is a past master at drawing pirates and now there's even a movie based on Pirates vs Scientists. We love The Pirate Cruncher though, mostly due to Jonny's fantastical pirates and creatures beautifully and deliciously painted in this book. The Pirates band together to search out lost treasure (this tends to happen a lot in pirate books, unsurprisingly). 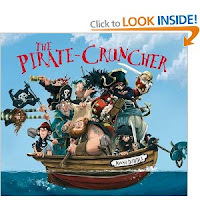 But there's a sting in the tail of this tale, as the treasure is not what it seems, and the hapless pirates soon meet up with....(Dramatic drum roll) The Pirate Cruncher! ARGHH! Such a superb book! What could possibly be better than a book featuring pirates or a book featuring dinosaurs? 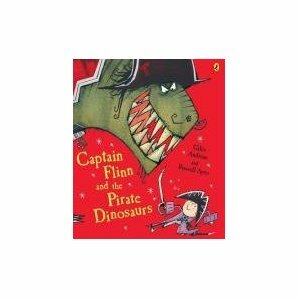 A book featuring pirate dinosaurs. A group of youngsters on a boring school trip get more than they bargain for when they go through a secret door at their local museum. It's a portal to a world inhabited by a mean bunch of scoundrels, dinosaurs who also just happen to be pirates! They're kidnappers and thoroughly nasty sorts - so it's up to Captain Flinn to band together with his pals to save the day. A genius combination of 2 children's books mainstays, that's sure to impress the piratical socks off your youngsters. It's not easy being an ordinary everyday kind of guy when your mum is a dyed-in-the-wool piratical lass. Carrying on with normal life while she sets sail and hunts for treasure, wiggling a merry sea shanty as she goes. Soon the hero of this tale comes to realise there's more to life than accountancy, balancing books and generally putting up with the rat race to earn an honest coin. 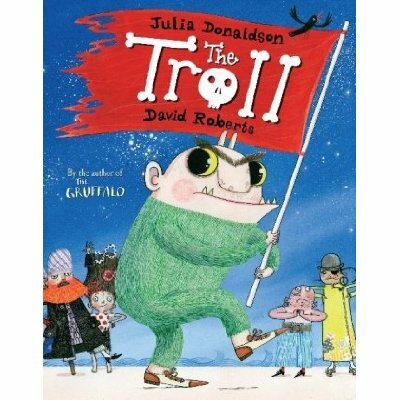 A lovely touching little tale beautifully illustrated and chock full of plenty of yo ho hos and ar har hars! We like our pirates to be a little bit hopeless. We like our trolls to be a little bit scary so Julia Donaldson's book "The Troll" mixes both together in a cross-over tale echoing The Three Billy Goats Gruff and throwing in pirates to create a heady mix of chaos. 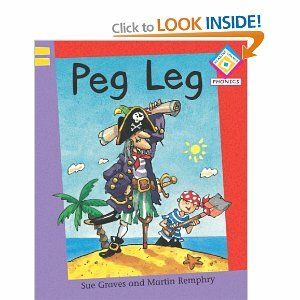 A great little phonics book featuring lots of sounding out and repetition, Peg Leg tells a standard piratical yarn in a way that supports early learning and reading skills in a fun and immersive way. 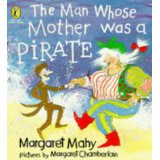 There are quite a few decent piratical phonics books around but this one was very well received by us, so it's worth searching out. Astonishingly, we haven't reviewed this but it's one of Charlotte's favourite Little Miss / Mr Men books. Mr Jelly, the shivering quivering cowardly cove borrows Mr Lazy's lilo bed for a dip in the ocean one afternoon. After Mr Lazy accidentally (!) 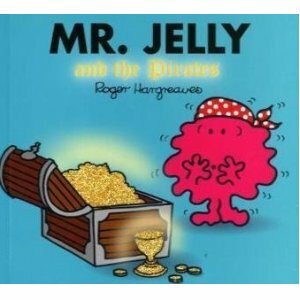 lets go of the rope tethering Mr Jelly to the shore, Jelly sets sail for adventure and mishaps - and meets some dastardly pirates. The poor little fellah soon finds himself pressganged into work on the pirate's ship but things don't quite go according to plan, and Mr Jelly's cowardly behaviour soon rubs off on the pirates themselves! 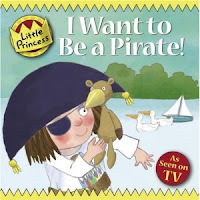 The Little Princess is the final saucy cove on our list, and in "I Want To Be A Pirate" she pinches the admiral's hat, boats and telescope and becomes a naughty little pirate. Very soon though, she realises that a pirate's lot is not a happy one and no one wants to play with her while she's indulging in typical pirate-like behaviour. Tony Ross's Little Princess books are great and this book was also one of the episodes in the "Little Princess" TV show. Yo ho!